Read our Vypr VPN Review to find out about all the positives and (very little) negatives of this great VPN Service. Vypr VPN is one of the top best VPN services available ! VyprVPN is a Switzerland-based VPN (Virtual Private Network) provider that was founded in 1994. The VPN provider is part of the Golden Frog Internet Freedom Consortium. The company provides a platform that is feature-rich with great speeds, great apps and a high level of customer support. VyperVPN’s key security and privacy backbone comes from the way the platform runs – the company owns and operates all its systems including both the software and hardware from end-to-end. This format allows the platform to provide users with super-fast speeds. Their Pro and Premiun accounts feature OpenVPN, Chameleon and 256-bit protocols on L2TP/IPsec. Chameleon is the company’s proprietary software that allows users to mask their VPN traffic using deep-packet inspection without compromising on transfer speeds. There is also a VyprDNS that is not logged which minimizes DNS leaks as well as eliminates middleman attacks. There is also a NAT Firewall that resides on the server-side that helps to protect users from unwanted inbound traffic. The platform works pretty well for the average user. But there could be some potential privacy issues. The company has a physical location in the U.S. This makes the VPN provider liable to U.S. privacy laws such as DCMA requests. Considering that the company keeps logs for 30 days, this could be a bit problematic. This is, however, not unique to the company and happens to other VPN providers located in the U.S. The basic package goes for $9.90 per month when billed on a monthly basis and $6.67 per month when billed on an annual cycle. 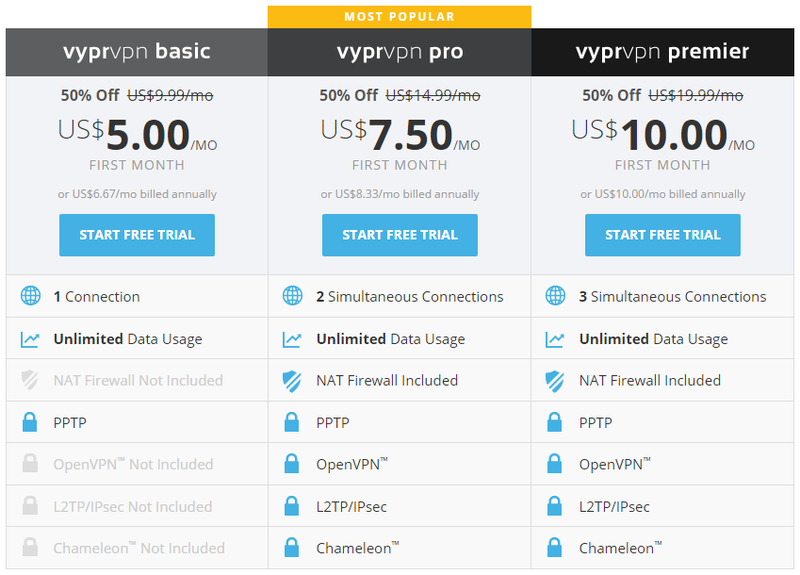 VyprVPN Pro goes for $14.99 per month when billed on a monthly basis and $8.33 per month when billed on annual cycle. VyprVPN Premium goes for $19.99 when billed on a monthly basis and $10.00 when billed on annual cycle. Granted, the pricing is a bit steep compared to what is available in the market, though you get lots of services that you normally don’t get with the average VPN provider. Paying annually also earns you hefty discounts. The company provides a risk-free trial period of 3 days to make sure you are completely satisfied with their services before committing your money. One of the features that makes the company stand out is their speeds which are absolutely fantastic. The platform performs well even with broadband connection regardless of where the user is located. Vypr does not try to limit users and users can easily switch between the company’s 700+ servers and 200,000+IP addresses any time they wish at no extra cost. A quick IPS check on the company’s network returns a clean response. A DNS leak test, however, reveals two servers, which might mean that the network has DNS leaks or that the company does not own all its networks. The company, however, says that a customer who conducts a leak test will never see Golden Frog network as the source since the privacy feature is designed to prevent DNS manipulation of any requests that come from the company. In other words, no customer-related information leaves the Golden Frog network. The company’s website looks every bit as impressive as you would expect from a company with such an impressive VPN platform. The site offers clear navigation and generous amounts of information and details. Once you sign up for a VPN account, you get a free online storage account as well as a DumpTruck. The DumpTruck website is equally impressive. The only downside is that the DumpTruck is pretty much standard and what you would normally get in the cloud storage market – something akin to a simpler version of DropBox. Nevertheless, the DumpTruck does have some nifty features and offers the same level of dedicated support as the main VPN service. Users, however, should be aware that Vypr has access to all the data stored in the DumpTruck. There is nothing you can really take from Vypr’s excellent customer support. The company has a 24/7/365 live support available as well as email support. It’s rather unfortunate that the company does not provide remote desktop services, though the speed efficiency and deep technical know-how by the support staff more than makes up for this shortcoming. Vypr has a great and intuitive feel on mobile as it does on a PC. The speed of the network, however, can be much slower on a mobile phone due to inferior CPU performance by the mobile phone or a slow mobile phone network. Overall VyprVPN is a good service but with some major privacy and security concerns it is a service that you should very carefully consider before going ahead with even though it has fantastic speeds and good technologies. Need more information ? please visit Vypr VPN homepage now !